You are interested in risk management and portfolio theory? You find life insurance mathematics exciting? Whether you see your future at one of the world's major financial centers such as London or Frankfurt, as part of an internationally operating insurance company, in an auditing company, in tax consultancy or in controlling: the Master's program Mathematical Finance and Actuarial Science prepares you well. In four semesters you will learn everything you need to know as a financial mathematician and actuary. The Master's program has two major fields of study: Mathematical Finance and Actuarial Science. At the beginning students choose a priority subject which they want to deal with in greater depth. The curriculum is designed in such a way that they can also acquire basic knowledge in a second subject. The financial and actuarial profile of the Master graduates is completed by various econometrics lectures. Those who aim at completing a professional actuarial training after finishing the degree can already visit lectures during the Master's program, that are later recognized by the German Association of Actuaries. The Mathematical Finance and Actuarial Science Master’s program is full time. The standard duration of study is four semesters. Ideally, students commence the Master’s program in the winter semester. It is also possible to commence in the summer semester. You can pursue the entire Mathematical Finance and Actuarial Science Master's program in English. Certain teaching sessions take place in German. Stochastic Analysis is the core subject of Mathematical Finance and Actuarial Science, independently of students’ chosen specialization. In the Mathematical Finance and Actuarial Science Master’s program, students complete their minor in Management (Economics). Courses in the areas of Mathematical Finance, Actuarial Stochastics and Mathematics constitute an important component of the degree program. Details of all modules that are relevant to the degree program, along with associated times and locations, are available in the department’s curriculum at TUMonline. Here you can create your own timetable and save it digitally. Whether you write on mathematical finance or actuarial mathematics, numerical analysis, mathematical optimization, statistics, probability theory or economics depends on the area in which you have acquired advanced knowledge. Read everything you need to know about the Master’s thesis here. All students must note the general information concerning examinations as well as the current program-specific Academic and Examination Regulations (FPSO). Information on the degree program's concept can be found in the degree program documentation. The prerequisite for the TUM-Master´s program "Mathematical Finance and Actuarial Science" is an accredited university degree in Mathematics, Physics, or comparable course of study. 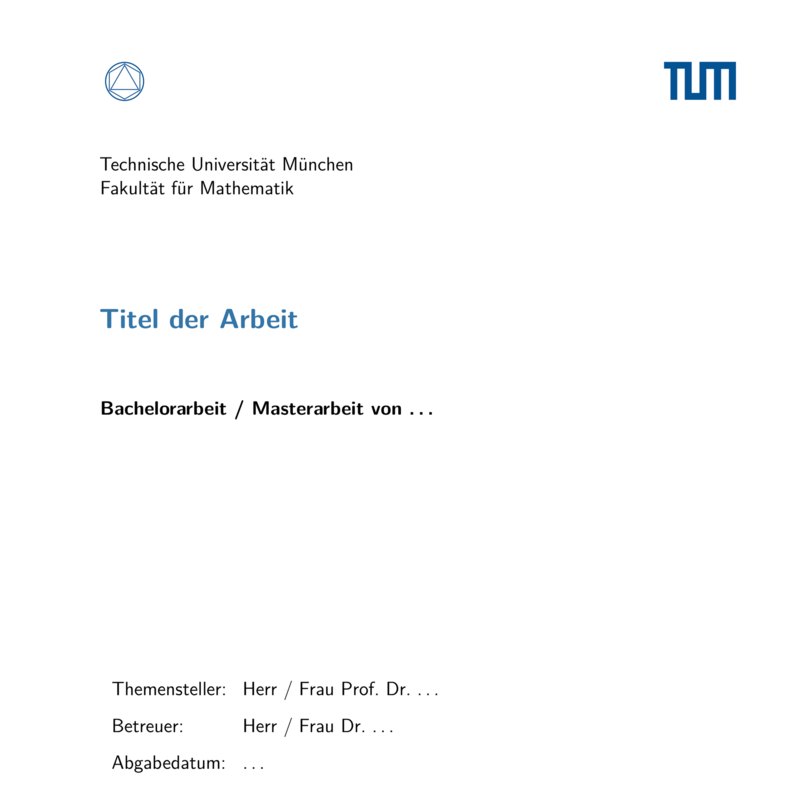 If you are interested in the Master´s program you should refer to the "Basics of the Bachelor´s degree course in Mathematics at the TU Munich" (see check list) to verify the required competencies in detail. You need to have acquired at least 18 ECTS credits from among the lectures listed in Table A3.1. Those in Table A3.2 are both mandatory. If these conditions have been missed by only a narrow margin, you'll have points deducted during the application process and maybe you'll be obliged to complete some of these modules during your first year of the Master´s program. If the commission thinks that there is too much missing content, your application will be rejected. If you would like to assess the mathematical level of our courses, please visit the homepage of Prof. Durrett and have a look at his book “Probability: Theory and Examples (4th edition, Cambridge U. Press, 2010)”. This book is one of the main references of our course Probability Theory. The fundamentals and in-depth knowledge of statistics and probability theory are tested in the interview for the Master´s program in Finance and Actuarial Science. These are based on Hans-Otto Georgii: "Stochastics: Introduction to Probability and Statistics (De Gruyter)", Chapters 1-5 and 7-12.